Federal Reserve Board Chairman Jerome Powell announced on Wednesday that it kept the benchmark interest rate unchanged. The statement comes after a two-day meeting of the FOMC, which decides on monetary policy. Powell said the job market would remain strong and inflation would stay around the 2 percent target for “several years.” This is great for the U.S because it gives the Fed some tools to use if the trouble are coming back. But what about the rest of the world? Are they healthy? The picture is different in Switzerland. The Swiss National Bank kept its benchmark three-month Libor at -0,75 percent on June 21st, 2018. 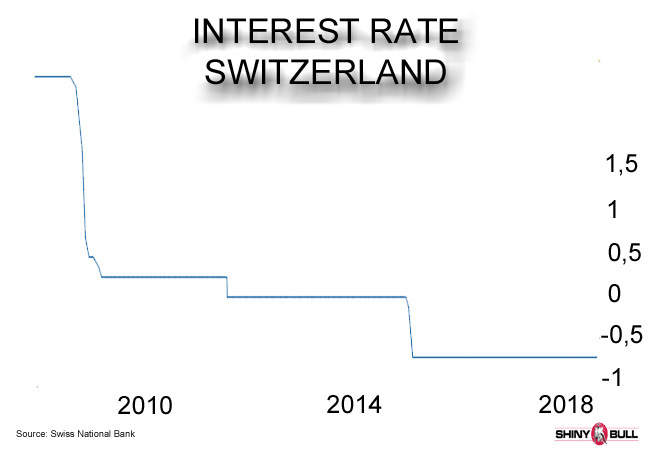 Interest rate in Switzerland reached an all time low of -0,75 percent in January of 2015, and it`s still at the same low-level. But they are not alone. Denmark followed Switzerland in 2015 and dropped the interest rate to -0,75 only a month after them. The Danish central bank follows the path set by the ECB and the key rate will be raised or lowered when the ECB changes the refinance rate. The Danish central bank`s main policy aim to hold the euro`s exchange rate within 2,25 percent either above or below 7,46038 kroner in an effort to keep inflation low and provide stability for exporter. Now the Danish rate is -0,65. Sweden joined the negative interest club, and the central bank of Sweden held its benchmark interest rate at -0,5 percent on July 3rd, as widely expected, saying monetary policy needs to continue to be expansionary for inflation to remain close to target despite strong economic activity. Japan is the last country in the world to have negative interest rate. They reached an all time low of -0,1 percent in July this year. The BOJ vowed to keep rate extremely low for extended period of time and opted for flexible bond buying at its July 2018 meeting. In addition, Japan`s policymakers left its key short-term interest rate unchanged at -0,1 percent and kept its 10-year government bond yield target around 0 percent. In other words; you are lending your money to governments and you are paying them interest for that, which mean it`s cheaper to put your money under your mattress. But that strategy can be very risky. The goal is to make people spend money rather than pay a fee to keep it safe. This is intended to incentivize banks to lend money more freely and businesses and individuals to invest. This is how you make growth. During deflationary periods, people and businesses hoard money instead of spending and investing. The result is a collapse in aggregate demand, which leads to prices falling even further. This again will lead to a slowdown in production and output which means higher unemployment. Negative interest rates can be considered a last-ditch effort to boost economic growth, which means when all else has proved ineffective and may have failed. 21 countries like Spain, Italy, Greece, France, Finland and Malta to name a few, are holding its interest rate at 0,00. The Euro zone is joining the club. In 2014, the ECB instituted a negative interest rate that only applied to bank deposits intended to prevent the Euro zone from falling into a deflationary spiral. The ECB held its benchmark refinancing rate at 0 percent on July 26th and reiterated that the monthly pace of the net asset purchase will be reduced to €15 billion from September to December 2018, and will then end. The ECB expect the interest rate to remain at their present levels at least through the summer of 2019, and in any case for as long as necessary to ensure the continued sustained convergence of inflation to levels that are below, but close to 2 percent over the medium term. The risk surrounding the euro area growth outlook can still be assessed as broadly balanced. Uncertainties related to global factors, notably the threat of protectionism, remain prominent.